For years it’s been under covers, almost out of sight, and seemed untouchable on the rare occasions it was out on the water – but now the harbour’s princess SY Ena has begun to shed her mystique- and the museum is lucky enough to provide a venue for her coming out. The classic lines, clipper bow and counter stern, raked spars and funnel, an intricate, beautifully engineered steam engine in immaculate condition, and an unbelievable varnish finish, SY Ena stops everyone in their tracks, and has them lost for words when they go aboard. 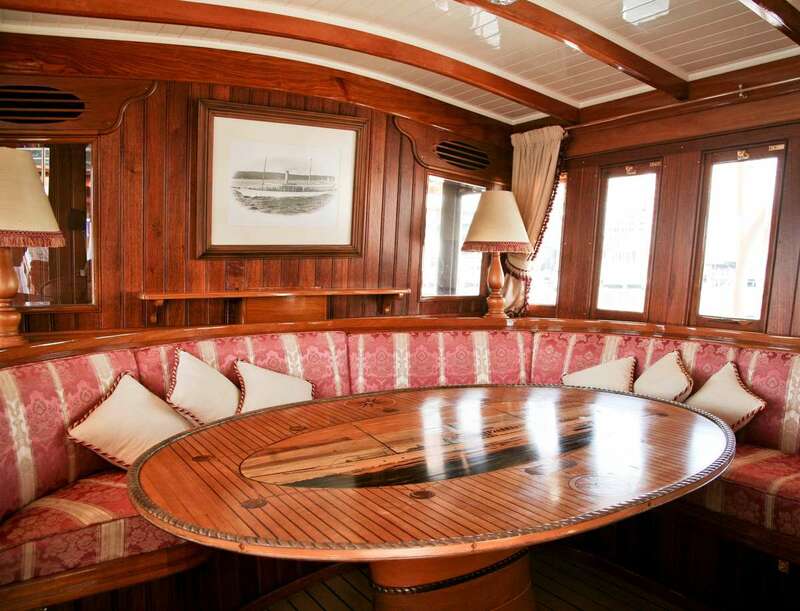 SY Ena is considered one of the finest examples of an Edwardian period steam yacht in the world. It was designed by renown Sydney naval architect Walter Reeks and built in 1900 by WM Ford Boatbuilders just across the water from the museum in Berrys Bay. When launched it showed that Australians could design and build a luxury craft of a standard equivalent to the highest level in Europe and North America, in a period when the country was still relatively isolated from these centres of commerce and industry. “LAUNCH OF MR T.A. DIBBS’ NEW STEAM YACHT. Named after Dibb’s wife Tryphena, it was used on Sydney Harbour for entertaining guests on the weekends, watching the yacht racing in grand style. Then war came, and renamed HMAS Sleuth, it was painted a dark grey all over and armed with a three pounder on the foredeck, and used to patrol Torres Strait for armed German raiders. It proved unsuitable for this work and was then used for patrol work on the east coast before finally serving as a naval training ship on Sydney Harbour. After the war it went back into private ownership and in 1933 when it was sold to a Tasmanian to work as a trading vessel shipping apples, a typical Tasmanian cargo and trade. This operation did not last long, the owner was caught up in legal disputes and SY Ena was seized by creditors for a long period. “ Former Luxury Steam Yacht, Naval Patrol, Now in Scallop Industry. The ups and downs continued- the Roche Bros operated it for 30 years, even taking Aurore up to Queensland fishing for shark. They sold it in 1974 and the in 1981 it hit an unidentified object in the D’Entrecasteau Channel and sank, but was not down for long. 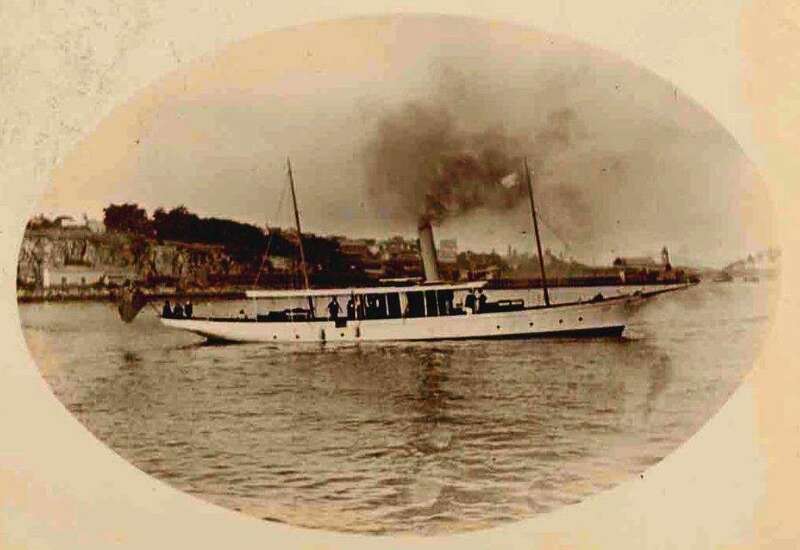 At this time Sydney businessman Pat Burke had been seeking a suitable craft similar to the Lady Hopetoun for use as a charter vessel on Sydney Harbour and his shipwright Nick Masterman recommended SY Ena, even though it was still underwater. A deal was finally completed and Burke formed a syndicate with flamboyant stockbroker Renee Rivkin and his solicitor David Baffksy. The three oversaw Masterman’s lavish reconstruction which was completed in 1986. SY Ena then steamed to Fremantle for the America’s Cup. Once back on Sydney Harbour it was used as a charter vessel until it was once again seized by creditors in lieu of payment by one of the owners. SY Ena was bought in 1991 at auction by a private buyer and then seen only rarely until now. The new owner has allowed SY Ena’s covers to come off, and the splendid vessel is moored at the museum for a short period before it moves to Melbourne to be a charter vessel on Port Phillip. It is open to the public for wharf side viewing during the morning- and bring sunglasses- it’s dazzling!